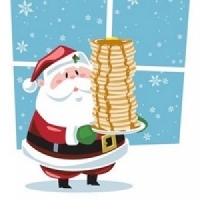 What could be better than Pancakes and Santa? If you're looking for something fun to do this weekend, bring your children to have breakfast with Santa! Saturday, December 15th is the annual event at Eastridge from 9am - 10:30am. Pricing is $9 for kids and $11 for adults in advance, and $11 for everyone the day of (if not sold out). Your child can do crafts, write a letter to Santa, and then hand deliver it. Santa will be giving away a small gift to all children attending. Be sure to bring your camera for some memorable pictures.